New research has revealed that a small number of innovative CMOs are generating huge success for their businesses by focusing on the customer experience - in the process providing a blueprint for the CMO of the future. 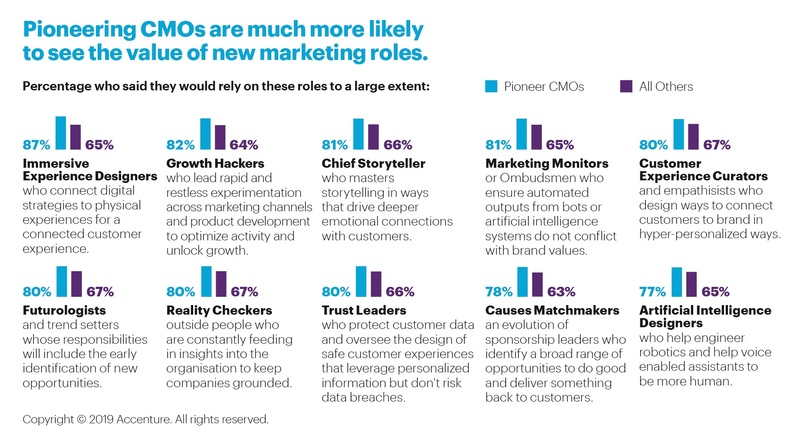 The role of marketers continues to undergo a profound shift, with the vast majority of CEOs and CMOs expecting the function to change fundamentally over the next three years. And new research from Accenture indicates that the blueprint for the next generation of CMOs already exists, thanks to a small number of marketing leaders that are demonstrating huge success by restructuring their organisations to deliver superior customer experiences. Historic evidence has indicated that CMOs can face obstacles in their efforts to gain influence over the customer experience. However, the new report — Way Beyond Marketing – The Rise of The Hyper-Relevant CMO — found that a small number of innovative CMOs that are prioritising customer experience are helping their organisations generate shareholder returns 11% higher than those of their industry peers. The research, based on a survey of nearly 1,000 CMOs and more than 500 CEOs at the world’s largest organisations, reveals that these marketing leaders — the top 17% according to Accenture — are driving transformational change at the highest levels of their organisations, helping them respond quickly to changing customer needs by rewiring their organisations to enable better integration and collaboration and deliver superior customer experiences. And CEOs elsewhere are now taking note of the impact that this latest-generation of CMOs are having on company performance. “These marketing leaders are finding creative ways to reinvent the customer experience, which is setting them apart from competitors,” says John Zealley, who leads Accenture’s customer insight & growth practice. The report notes that one of the main characteristics of these leading CMOs is the different roles and skills that they develop and recruit within their teams. These include immersive experience designers, storytellers, growth hackers and futurologists. The study also suggests that these innovative CMOs actively partner with others in the C-suite to create customer-obsessed organisational cultures. Far more likely than their industry peers to spend most of their time driving disruptive growth, these CMOs use emerging technologies to predict customer behaviour and identify untapped revenue streams. While the majority of marketing departments and marketing leaders conform to more traditional duties, what the Accenture study also underlines is that there is an expectation that these will change in the near future to accommodate more innovative thinking – with 90% of CEOs and CMOs surveyed agreeing that the function will change fundamentally over the next three years. Mhairi McEwan, Accenture’s managing director and marketing practice lead, customer insight & growth, highlights what he believes CMOs should be prioritising as their roles develop. What’s particularly interesting is the focus on insight and collaboration, listening to customers and breaking down barriers between departments. Essentially it is about really listening to the full Voice of the Customer and sharing the insights to the right parts of the organisation.